This week one of America’s oldest media companies, The New York Times, has been using some social media tools, The City Room blog, to create a dialogue, or at least Q&A, with Roland Lewis, the president and chief executive of The Metropolitan Waterfront Alliance about the New York City waterfront. While Mr. Lewis doesn’t address every comment submitted, he does a good job of fielding a number of interesting questions about the current status and future plans for New York harbor. You can read the first day’s Q&A here and the second day’s here. It seems like a great way for a nonprofit to deliver their message, engage stakeholders and recruit some new ones. Kudos to the NY Times and the Metropolitan Waterfront Alliance! On Saturday afternoon I was working on a Powerpoint for the live auction for the MattSail Gala that was taking place in the evening when our doorbell rang. It was our old friend Mark Barry (NOT this one) who stopped by to let us know that the Buzzard’s Bay Anglers Club was holding a junior fishing derby on the docks just outside our house. He invited Luke (5) and Joy (3) to come join in the fun and try their luck at fishing. The Buzzards Bay Anglers generously provided all of the equipment which amazingly the kids were then able to keep. There were nifty rods and a cool little tackle box that was a “reel” hit with Luke and Joy. On the way to the fishing spot, Luke ran into his buddy Stefan and his dad, “Sushi Chef” Dan. The boys got right into the fishing with Mr. Barry providing pointers and support to Luke. Stefan was the first to catch a fish and if you look really hard you might see it in this photo. 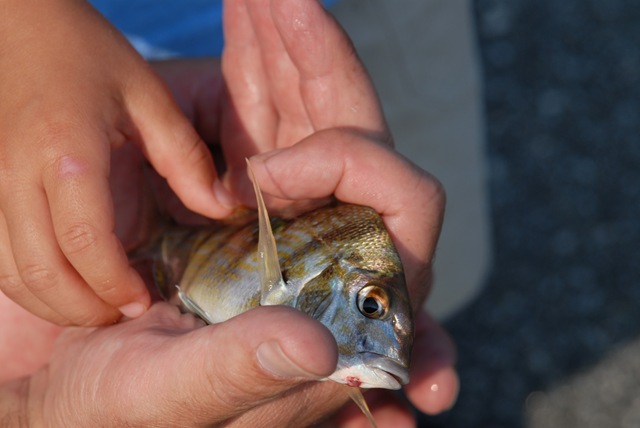 Then Luke caught his first fish, a beautiful striped scup. It was all pretty exciting. In fact, it was so exciting, Luke wanted to go back to the dock this morning and try his luck again. Yesterday the bait was squid but this morning we used Mummy’s home-cooked ham. The fish didn’t seem to mind too much as Luke caught another. When I was a kid I fished a lot on a pond at a cottage that our family rented each summer. There we’d catch and release sunfish like there was no end. I really enjoyed it until one day I hooked my cousin Laurie instead. Hmm, not good but thankfully I got her on the meaty bit of the arm and she survived and still talks to me today. At 5, Luke is getting right at the age where he’s capable of doing these types of activities and boy it’s fun to watch (and teach). Catching his first fish is a real milestone and I’m 100% certain that he will catch many more off the end of the Mattapoisett docks this summer. 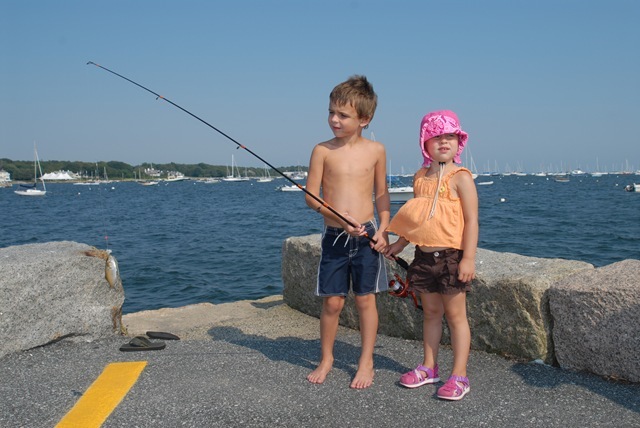 It’s great that there are organizations out there like the Buzzards Bay Anglers Club that give kids the opportunity to experience the thrill of a new sport or activity. 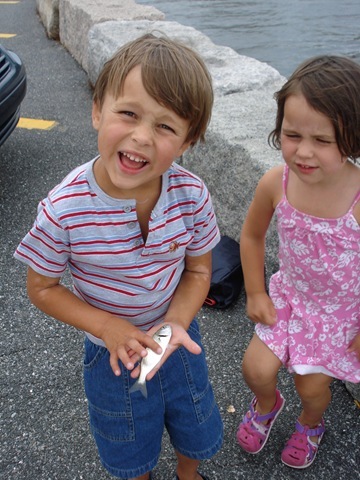 Thanks to the Buzzards Bay Anglers Club for the great rods, reels and tackle for Luke and Joy! But more importantly thanks for giving our family a chance to do something really fun together on a Saturday afternoon. I can guarantee you’ll see us out there catching fish again and telling plenty of stories about it too. Posted on July 28, 2008 August 11, 2008 Author Peter A. MelloCategories workLeave a comment on Monday Morning Motivator – Too many good ideas! Anyone who reads the Sea-Fever blog will not be surprised that I’m very interested in seeing this movie in the fall. I’m particularly interested because I know one of the young people involved. Jesse Fielding was one of only a handful selected from a pool of thousands to take part in this project. His father/guardian is Steve Baker, one of my former colleagues over at the American Sail Training Association. Steve also has a sailing blog called SailScape. Here are links to the Morning Light Project website and the movie’s website. Life is too short! Live it like this! Randy Pausch died today from pancreatic cancer at the age of 47. This was his “last lecture.” I highly recommend it and guarantee you’ll learn something valuable. Posted on July 25, 2008 August 21, 2008 Author Peter A. MelloCategories Leadership, life, ValuesLeave a comment on Life is too short! Live it like this! Today in 1956 the Italian line SS Andrea Doria collided with the Swedish American Line’s SS Stockholm resulting in one of the most famous maritime disasters of all time. Remarkably, while over 1600 passengers and crew were aboard the Andrea Doria, only 46 lives were lost as a result of the collision even though half her lifeboats were inaccessible due to the severe list she took on after the incident. 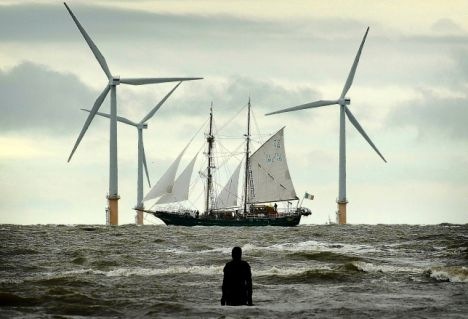 Much of this can be attributed to the improved maritime communications post-Titanic and the close proximity to the United States mainland and nearby vessels who quickly rendered assistance. A week or so after the casualty, a team of divers located the Andrea Doria on the ocean’s floor and, led by a young Louis Malle, they were able to shoot the first underwater footage of the vessel in her final resting place. Of course, Malle developed into a prolific and awarded film director who was nominated for three Oscars and won several awards at Cannes. One of his earliest successes was Le Monde du Silence (The Silent World) which he co-directed with famous underwater explorer Jacques Cousteau and which won Canne’s prestigious Palm d’Or (Golden Palm) in 1956. Here’s an snippet for this groundbreaking film. While the Andrea Doria met her end 52 years ago, it’s amazing that the SS Stockholm continues to sail today under the name MS Athena for Classic International Cruises; not surprisingly, there’s no mention of her special place in maritime disaster history which probably is a sound marketing strategy. For another famous director who launched his career doing maritime movies check out the previous post Stanley Kubrick and The Seafarers.